No chapter at your college? Find out how. What is Pi Gamma Mu? Our mission is to encourage and promote excellence in the Social Sciences and to uphold and nurture scholarship, leadership, and service. Pi Gamma Mu is the oldest and preeminent interdisciplinary social science honor society. The mission of Pi Gamma Mu is to encourage and promote excellence in the Social Sciences and to uphold and nurture scholarship, leadership, and service. Pi Gamma Mu serves the various social science disciplines which seek to understand and explain human behavior and social relationships as well as their related problems and issues. Currently, there are around 150 active chapters in the United States and overseas. Pi Gamma Mu's constitution defines the social sciences to include the disciplines of history, political science, sociology, anthropology, economics, psychology, international relations, criminal justice, social work, social philosophy, history of education, and cultural/human geography. Membership is also extended to interdisciplinary social science areas that build on the core social science disciplines, such as business and society, education, minority studies, public administration, international studies, public finance, leadership studies, consumer behavior, public policy and organizational behavior. Each year, the Pi Gamma Mu International Board of Trustees recognizes Pi Gamma Mu's most active chapters by placing them on the annual Roll of Distinction (the highest award for chapters) and Roll of Merit. Visit the Chapter Honor Rolls page to see the 2018 Rolls. For the first time in Pi Gamma Mu history, the Society is offering Pi Gamma Mu stoles for sale via our merchandise page! 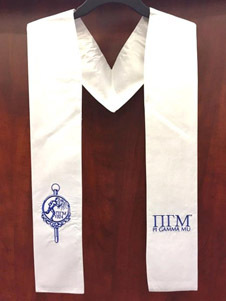 Show off your affiliation with Pi Gamma Mu during commencement by wearing this custom stole. This white satin graduation stole is 76 inches in total length and has royal blue embroidery. On the left side are the Greek Letters and Society name and on the right is the Society's key. Only members of Pi Gamma Mu may wear this graduation regalia. $24. Buy a Pi Gamma Mu stole and honor cords and save $5! The 2018-2019 academic year marks the third consecutive year that chapters throughout Pi Gamma Mu International Honor Society in the Social Sciences have come together to participate in a society-wide service project to serve their respective communities. This spring participating chapters will collect donations for a charity in their community in support of the homeless. We are thrilled to announce that the 2020 Pi Gamma Mu Triennial International Convention will be held in Washington DC on November 12-14, 2020. Events will include student paper presentations, a Leadership Development Program, chapter and student poster presentations, a keynote address, a welcome reception, an awards ceremony, roundtable and panel discussions, student elections, and more! The convention planning committee is hard at work developing a spectacular program. Stay tuned for details. The 2017 Pi Gamma Mu Triennial International Convention was one of the most dynamic to date with a spectacular program including student paper presentations, a new Leadership Development Program including special workshops and a decision-making simulation at the Truman Presidential Library, a Chapter Development Showcase including poster presentations by some of Pi Gamma Mu's most active chapters, a keynote address, a welcome reception, an awards banquet, roundtable and panel discussions, student elections, and more! Following a lengthy development and review process that spanned several years, Pi Gamma Mu adopted an updated Constitution and Bylaws at its 2017 Triennial International Convention in Kansas City, MO in November. Several face-to-face meetings of the Board of Trustees and dozens of telephone meetings resulted in the new documents that will help guide the Society into the future. Chapters voted to approve the changes by returning ballots they received in the mail. Review the Constitution and Bylaws on our website. Pi Gamma Mu is seeking to charter new chapters at colleges and universities around the globe. Call 620-221-3128 or email [email protected] to learn more. There is no cost to the university to host a chapter of the society and there are many benefits of membership. Members are eligible to apply for one of eleven annual scholarships, present research papers at international and regional conventions, submit articles for publication in our peer-reviewed professional journal, and those interested in federal jobs have the possibility for advancement in government service rating. Pi Gamma Mu is interdisciplinary in nature, allowing chapter sponsors and members to expand their professional networks by working collaboratively with society members from various fields of study. Each chapter is eligible to apply for up to $300 in lectureship grants annually. Each chapter must have one or more faculty sponsors at the university. Contact us to learn more today! The International Social Science Review (ISSR) will be published not twice—but thrice!— beginning in 2017. We have been receiving such a high volume of quality research papers that the Board of Trustees of Pi Gamma Mu has authorized a third issue of the journal annually. So please keep an eye out for a Spring, Fall, and Winter issue! Pi Gamma Mu's commitment to scholarship in the social sciences is manifested most tangibly through the publication of our peer-reviewed journal. Each edition of the ISSR contains several peer-reviewed articles and book reviews, which are written by scholars and carefully polished for publication by the book-review editor and the editor-in-chief, Dr. Candice Quinn. In order to help increase the accessibility of the journal, it was transitioned from a print version to an online format in 2014. No subscription is required and the journal often contains articles and book reviews written by Pi Gamma Mu members and faculty chapter sponsors. More information about the journal is available on the International Social Science Review page. Explore the journal online at https://digitalcommons.northgeorgia.edu/issr/ or type "International Social Science Review" into any search engine. Time was when groups and organizations elected historians to keep track of and record their activities and achievements. HOW MUCH DO YOU KNOW ABOUT THE HISTORY AND TRADITIONS OF YOUR PI GAMMA MU CHAPTER? Some chapters have traditions that span the whole 85 years of the organization's existence while others have only been recently chartered. But whether yours is an older chapter or a recent one, preserving and recording for posterity that history and those traditions is important. Pi Gammu Mu has started a nationwide drive to reactivate lapsed or inactive chapters. To reactivate your chapter, simply click here and fill out this simple online form to start the process. There is no charge for this service and we will immediately begin processing your chapter's reactivation.